Sony’s DPF-D80 digital picture frame rocks Sony’s sleek design sense. This 8-inch picture frame is shiny and black, while the screen is matte, and button labels and the Sony logo are backlit (you can disable the light behind the logo). The frame feels solid and well-constructed, and it fits right in next to other tech gadgets on your desk. We tested the black 8-inch version; this model also comes in 7-inch, 9-inch, and 10-inch versions, and in white and red variations. You navigate the frame’s controls via five buttons along the back of the screen’s right side. I found the menus easily navigated and nested logically, but if you touch the front of the frame while using the controls you’ll leave a terrible mess of fingerprints. It’s much neater to use the included remote control. Color on the sharp 800-by-600 screen pops well, looks saturated, and showed no noticeable distortion in our tests. Like most frames, the DPF-D80 allows you to adjust brightness but not contrast or color. Luckily, it presents color quite accurately. The DPF-D80’s slide-show mode offers the usual transition effects, and allows you to either view images linearly or randomly shuffle them, a feature missing on many other digital frames we’ve tested. We ran slide shows off an SD Card with nested folders, and they played without a hitch. The frame accepts most media cards (MemoryStick, MemoryStick Duo, SD Card, MMC, CompactFlash, Microdrive, and xD-Picture Card; plus M2, miniSD, and MicroSD via an adapter). It also has 256MB of internal memory. Unfortunately, it does not play video, though it does offer calendar and clock modes. I especially liked the fact that this frame can handle large image files (up to 100MB) and, incidentally, is equipped to deal with 48-bit color--whenever that standard hits the mass market, that is. My only quibbles were with the price, which feels high considering its lack of extras (like video and Wi-Fi), and the proximity of the power button to the menu button. 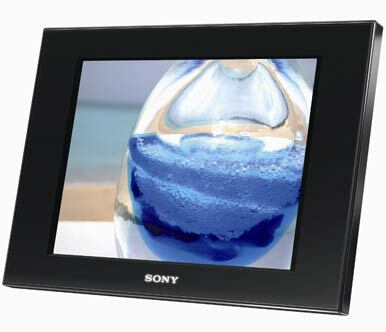 Sony’s DPF-D80 digital picture frame has good image quality and has nice slideshow features. At this price, however, you can get a frame that has more, like Wi-Fi and video support.